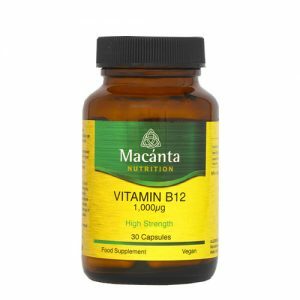 Macánta Vitamin B12 gives you 1mg of the highly absorbable and effective methylcobalamin. In this form, it is bioidentical to the active form found in the body. B12 is required by the body for the normal development and regeneration of red blood cells and plays an important role in energy production. Take 1 capsule per day. As a food Supplement for adults, take 1 capsule per day (in the morning) with or before food. Do not exceed daily dose unless otherwise directed by a healthcare practitioner. Food Supplements should not be used as a substitute for a varied diet and healthy lifestyle. Not intended for use if you are pregnant or lactating. If you are taking any medication or have a medical condition please consult your healthcare practitioner before use. Keep out of reach of children. Do not use if lid seal is missing. Store out of direct sunlight, in a dry ambient location.